1. MAC Cosmetics #129 Powder & Blush Brush, $85. The noticeable difference between this brush & the #150 Powder Brush is the handle size. As I was only really buying this brush to apply powder I wanted a smaller brush head anyway. 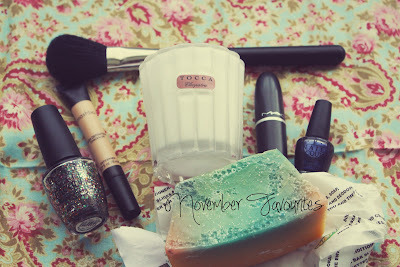 This brush is fantastic though, it is relatively soft & applies both pressed & mineral powdered products really well. 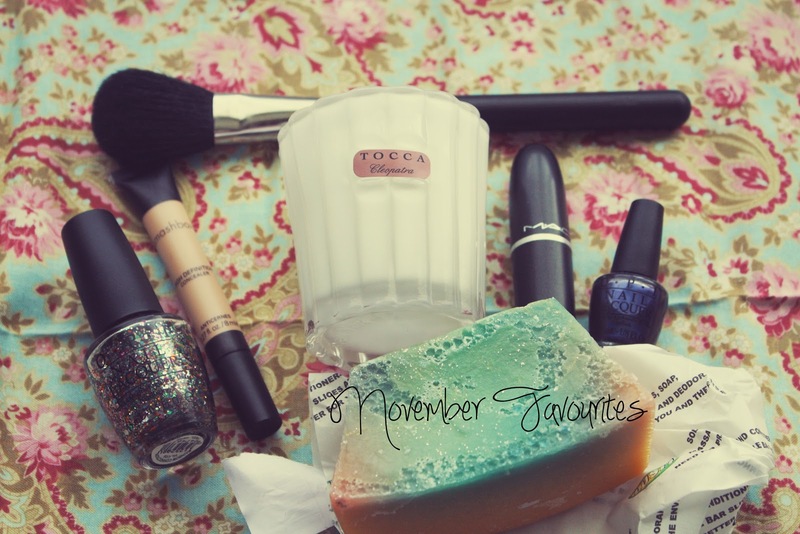 I'd highly recommend this brush if you're after one for powder. 2. Smashbox Cosmetics High Definition Liquid Concealer in Light, $40. This concealer is for anyone with fair skin that has pink undertones to it. As it is a liquid formula it is quite thin but the product itself is opaque once applied to the face. It blends easily with either a Concealer brush or your hands & lasts pretty well. 3. MAC Cosmetics Amplified Creme Lipstick in Impassioned, around $40. 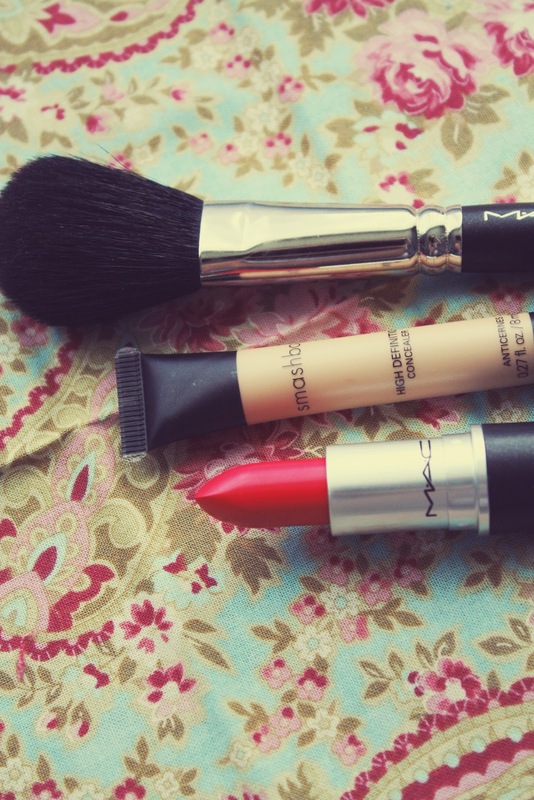 Cremesheen & Amplified are the best lipstick formulations from MAC in my opinion. The fact that this one combines both of those has got to be a blessing from the lipstick gods. The colour is a bright fuschia pink which can look slightly red in certain lights. It is very pigmented so sometimes it can be a bit scary to wear but it does look fantastic. As it is an Amplified finish the product is extremely hydrating on the lips & lasts really well also. 4. OPI Rainbow Connection Nail Polish (Limited Edition), $27-This rainbow glitter is also in the Kardashian Kollection under the moniker 'Rainbow In The Sky-lie' if it's something you're after. I love this polish, all the rainbow glitter colours look so pretty & sparkly on the nails. You can wear this by itself or over other colours & it looks amazing. As the particles are quite chunky it is a lot easier to remove than other glitter polishes on the market, huge bonus! 5. OPI Into The Night Nail Polish (Limited Edition), a gift. This colour was released as part of the Amazing Spiderman collection earlier in the year. It is a shimmery royal blue colour & is super pretty. I paired it with Rainbow Connection & the effect was stunning, my toes looked like the night sky for a while. 6. Tocca Cleopatra Candle (Limited Edition), $38. 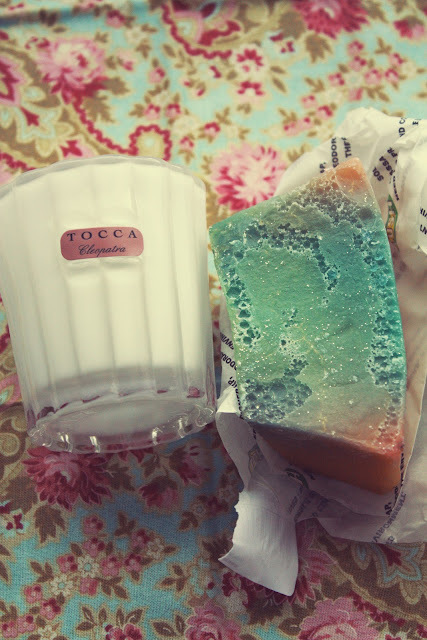 I'm sure many of you have heard of Tocca, they make the most deliciously scented candles. This was one of the 4 they released in smaller sizes as part of a Holiday collection of products & this Cleopatra mini was the last in New Zealand so I had to snag it while I still could. The scent is a blend of Grapefruit & Cucumber, it smells just like a luxury perfume it is amazing. Thankfully this is available year-round in a larger size too. 7. Lush Angel's Delight Soap (Limited Edition), from $7.90. I've already written about this soap here & when that soap had run out I raced back out to buy another one. This soap smells like Just Juice Bubbles & it leaves your shower smelling amazing as well. It gets bonus points for being colourful & sparkly too. *All photos are my own. Please credit Nana Wintour Blog if you reuse them. Thank you so much! I've just had a look at your blog & love your photos. They're so pretty! Thank you Tanii, MAC lipsticks are amazing! !